It seems that the producers of "Pirates of the Caribbean" got it all wrong when they recruited Keith Richards to play Capt. Jack Sparrow's dad in the third installment of the film. 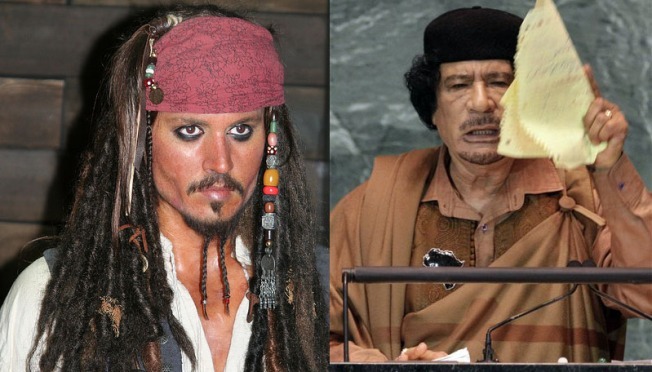 Libyan leader Colonel Moammar Gadhafi is a dead ringer for an old, swelled up, wrinkled wax figure of Captain Jack. It at least seems entirely plausible that the decrepit dictator is attempting to emulate the celluloid swashbuckler. It's not just the flair for fashion and facial reconstruction. He's certainly been acting like a drunken pirate on shore leave here in New York. And like a pirate, he's been pegged as a misunderstood anti-hero by some, with his flamboyant display at the UN getting some begrudging respect. A Financial Times piece paints the loony leader as an eccentric crank who, it turns out, made some good points, going so far as to say, "Gadhafi was even quite witty."